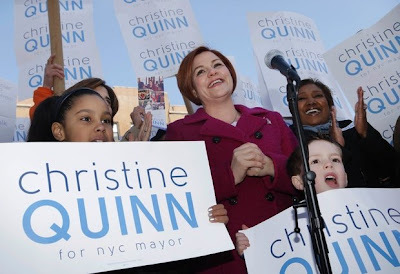 A Liberal's Libretto: Christine Quinn - the mayoral candidate with a record to stand on. Christine Quinn - the mayoral candidate with a record to stand on. As many of you know, I have been a staunch supporter of Christine Quinn's candidacy for NYC Mayor from the moment she announced. In fact, quite a while before. Many have asked me why? Isn't she just Michael Bloomberg, The Sequel? Speaker Quinn has quite a record and that record speaks volumes, not only about her values, but also about her tireless advocacy for all New Yorkers. That's why I'm fervently supporting Christine Quinn. As a community organizer, anti-violence advocate and now as the second most powerful elected official in the City, Speaker Quinn has created thousands of new jobs, improved early childhood education - including making Kindergarten mandatory, stopped the lay-offs of some 4000+ teachers, passed a living wage law to increase salaries on city funded projects, cracked down on bad landlords, balanced the budget while protecting vital services, increased access to health care and helped keep our streets safe while fighting for one system of justice in all communities. But, it seems that many New Yorkers may be choosing celebrity status over a substantive record. At least for the short term. You see, Speaker Quinn's lead in the polls has briefly been encroached by the celebrity status of disgraced former congressman Anthony Weiner, who entered the mayoral race recently via a late night video posted to his website. What made Weiner a celebrity? The same thing that made the entire Kardashian clan celebrities. The same thing that makes the Real Housewives celebrities. The same thing that might make you or me into a celebrity: scandalous intrigue. But, standing beside Weiner's celebrity status is his reputation. And, it's not just his reputation of lying to cover up his shirtless tweeting, it's also his reputation as a hot-headed, vitriolic and stubborn congressman that follows him. Perhaps that's the reason why the disgraced congressman only passed one bill during his congressional tenure. His one-bill-record pails mightily when compared to Quinn's achievements - which are due, no doubt, to her tenacity and ability to see both friends and foes as possible allies. Allies willing to compromise for the greater good of the City and it's residents. This morning, during an appearance on MSNBC's Morning Joe, Speaker Quinn addressed Weiner's record. We need a mayor who is willing to be resolute in her advocacy for all New Yorkers and our city - yet, a mayor that is willing to compromise when needed, or stand her ground if necessary, to get things accomplished. Christine Quinn has shown a tried and true record of being that kind of speaker and I know she'll be that kind of mayor. Please show your support for Christine Quinn, today. Don't wait. Sign up to volunteer with the Quinn For New York campaign or contributing what you can. Let's keep New York moving forward.